Reference the new essentials for CMS compliance in the health care environment. 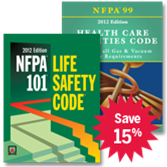 Get the 2012 editions of NFPA 101® and NFPA 99 as a Set and SAVE 15%! The U.S. Centers for Medicare & Medicaid Services (CMS) has officially adopted the 2012 editions of NFPA 101: Life Safety Code® and NFPA 99: Health Care Facilities Code. Health care providers that participate in federal reimbursement programs are now mandated to meet the new (CMS) Conditions of Participation (COP) based on the 2012 Codes -- which have both been significantly revised from previous editions. The 2012 edition of NFPA 101: Life Safety Code. This edition raises the bar for occupant safety in all types of new and existing buildings including health care occupancies. Major changes in the Code help increase protection to people from fire and related hazards. Revisions include requirements that allow more home-like environments for nursing homes and are more reflective of the design and operation of other health care facilities. The 2012 edition NFPA 99: Health Care Facilities Code. Introducing a groundbreaking shift to a risk- vs. occupancy-based approach, NFPA 99 reflects a centralized health care environment where it is the risk that a procedure poses to patients and staff, not the location where it is conducted. This edition introduces new chapters on security, fire protection, and information technology; plus updates to Chatper 5, Gas and Vacuum Systems and Chapter 6, Electrical Systems. Get up-to-date on the new CMS requirements and stay up-to-code with this special offer from NFPA®. NFPA's special Set is essential for anyone concerned with fire and life safety in a health care setting or who must apply or enforce the changing requirements now adopted by CMS.